If you’re like me, nothing is more satisfying than a really good grilled cheese sandwich. Apparently so many others agree with me, April 12 has been declared National Grilled Cheese Day. If you want to partake of a tasty grilled cheese in honor of the holiday, here are ten places in the Orlando area which have managed to elevate the sandwich above the norm. Enjoy a Southern cuisine spin on the sandwich with the Grilled Ham & Pimento Cheese sandwich. It comes with a side of fries or hush puppies. You can also get it without the ham. I haven’t forgotten about our vegan readers. If you want to enjoy the holiday, may I suggest Dandelion’s Kimchi Melt, a grilled “cheese” with housemade kimchi and cashew tempeh, served on your choice of Olde Hearth Bread Co’s sourdough or wheat bread. If you’re over by Epcot or Disney’s Hollywood Studios, stop in at this sports pub eatery on the Boardwalk. Get the Pulled Pork Grilled Cheese, featuring bbq pork, cheddar cheese, and a liquid cheese sauce, on Texas Toast with a slather of slaw and a side of fries. I usually split one with a friend, but I make no judgement if you eat one by yourself because it’s so good. The pub’s menu features a Grilled Cheese sandwich that has cheddar, mozzarella, and goat cheese on thick Challah bread with spinach and sauteed apples, and served with house made boozeberry jam. You can even add bacon to that, if you’d like. Are you drooling yet? This cheese shop offers several tantalizing options in sandwich form. Get the Grand Fromage featuring a slice of prosciutto, grilled on Old Hearth Bread Co’s bread. After a revamp that includes a new burger and sandwich menu by Guy Fieri, I can safely say if you want to celebrate National Grilled Cheese Day, you’ll want to get the Pimento Grilled Cheese here. It features pimento cheese, “super melty cheese,” and Fieri’s six-cheese mac-n-cheese stacked between three slices of sourdough bread. It really is big enough to share. The regular grilled cheese is yummy, featuring your choice of 4 cheeses, but step outside the box and get the Seasonal Berry Melt, featuring brie cheese, seasonal berries, red onion slices, and honey mustard on your choice of bread. Billing themselves as a “grilled cheese bar,” the restaurant has several tasty choices for celebrating the sandwich holiday. Be a purist and go with The Melt, a gooey blend of cheddar, swiss, muenster, and mozzarella. It’s served with a home made creamy tomato soup dipper and your choice of french fries or organic field greens tossed in a champagne vinaigrette. There are two Orlando-area locations to enjoy a variety of grilled cheese sandwiches for the holiday. Try the Blackberry Melt, featuring Fontina cheese, applewood smoked bacon, blackberry mash, and arugula, for a nice blend of salty and sweet with a hint of peppery spice. Located in The Crossroads shopping center near Disney Springs, this eatery specializes in the grilled cheese sandwich. However, if you want something special, get their Grilled Cheese Donut. It sounds weird, but it’s a lovely blend of salty and sweet. You can also get a regular grilled cheese for only $2 all day. 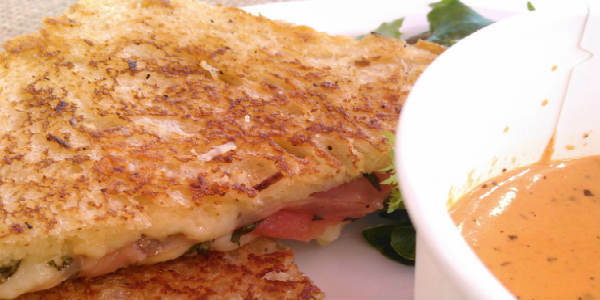 Do you have a favorite grilled cheese we haven’t mentioned? Let us know what it is and where to get it in the comments below.